"Claire Foy gives a fine performance as Lisbeth Salander, but overall The Girl in the Spider's Web fails to deliver the tension and gravitas of the previous films"
Following the publication of original Millennium trilogy (a series of Swedish psychological crime novels by Stieg Larsson); The Girl with the Dragon Tattoo, The Girl Who Played with Fire and The Girl Who Kicked the Hornets' Nest with their world wide sales success and subsequent success as a motion picture trilogy comes The Girl in the Spider's Web. The latter written by David Lagercrantz as Stieg Larsson passed away after completing the original trilogy, with publication taking place posthumously. The original trilogy was filmed in Sweden and primarily in the Swedish language with Michael Nyqvist as Mikael Blomkvist and Noomi Rapace as Lisbeth Salander as the principal characters. A few years later this was followed by an American remake of The Girl with the Dragon Tattoo directed by David Fincher, with Daniel Craig as Mikael Blomkvist and Rooney Mara as Lisbeth Salander. The Girl in the Spider's Web continues the story with the principal characters Lisbeth Salander and Mikael Blomkvist from the original novels. Not without it's share of critics in terms of style, characterisation and story, the novel has now been turned into a new feature film. The Girl in the Spider's Web stars Claire Foy as Lisbeth Salander and Sverrir Gudnason as Mikael Blomkvist. Not really referencing the previous outings in any significant depth, the film presumes prior knowledge of the characters at the same time feeling like a reinvention/reboot of the franchise, that being said Claire Foy is Lisbeth Salander an emotionally and physically scarred world class computer hacker. She is the survivor of a traumatic and abusive life both as a child and as an adult, resulting in her outing and punishing men who abuse women. Her past has left her with difficulties in forming friendships and relationships with men or women. Sverrir Gudnason is investigative journalist Mikael Blomkvist writing for the publication Millennium. He has a complicated relationship Lisbeth, which has veered from working together to romantic involvement. The Girl in the Spider's Web plot revolves around Lisbeth being hired by a computer programmer Frans Balder (Stephen Merchant) to steal a computer program called Firewall from the NSA (National Security Agency) that he developed to access the world's nuclear codes, but now believes it's too dangerous to exist. This leads to the typical cat and mouse game of what follows when Lisbeth has stolen the program involving Edwin Needham (LaKeith Stanfield) an NSA security expert tracking her. Followed by Gabriella Grane (Synnøve Macody Lund) the deputy director of the Swedish Secret Service. 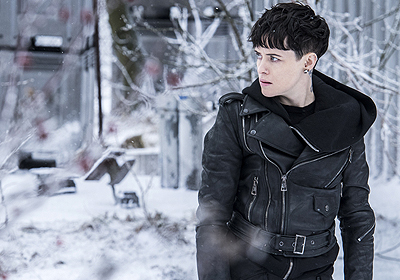 Claire Foy gives a fine performance as Lisbeth Salander, but overall The Girl in the Spider's Web fails to deliver the tension and gravitas of the previous films. Feeling like an average espionage thriller (a poor man's version of the Bourne film series), rather than the continued exploration of Lisbeth Salander's character and story arc or her relationship with Mikael Blomkvist. The film fails to add anything significant to the previous trilogy. It's full of cliches with an unimaginative plot line and earns a forgettable two half stars.